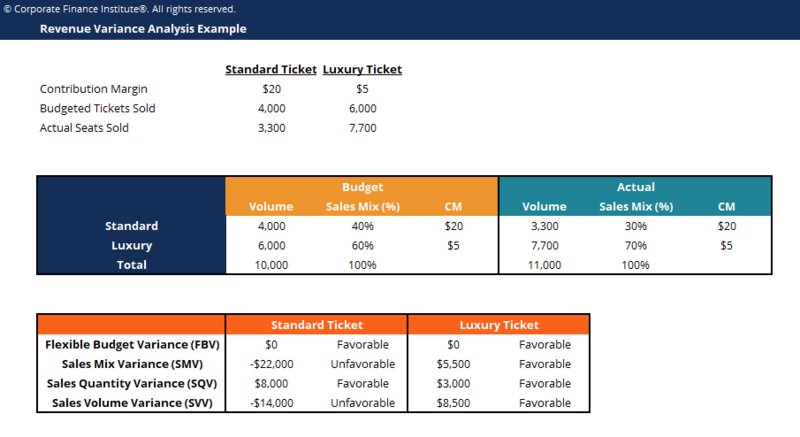 This revenue variance analysis template demonstrates how to use the column-based approach to calculate the three different types of revenue variance. Revenue Variance Analysis is used to measure differences between actual sales and expected sales based on sales volumeDays Sales in Inventory (DSI)Days sales in inventory(SDI) indicates how many days it takes to sell or convert a company’s current stock into sales during a given period. Formula metrics, sales mix metrics, and contribution marginContribution MarginContribution margin is a business’ sales revenue less its variable costs. The resulting contribution margin can be used to cover its fixed costs (such as rent), and once those are covered, any excess is considered earnings. calculations. Information obtained from Revenue Variance Analysis is important to organizations because it allows management to determine actual sales performance in relation to the perceived performance of the company for specific products. It helps businesses identify which products are performing better in the market. Overall, variance analysis helps management make better strategic and business-level decisions to maximize its profitability.